Feb 21st, 2009 – I've been on a mission. My mission? 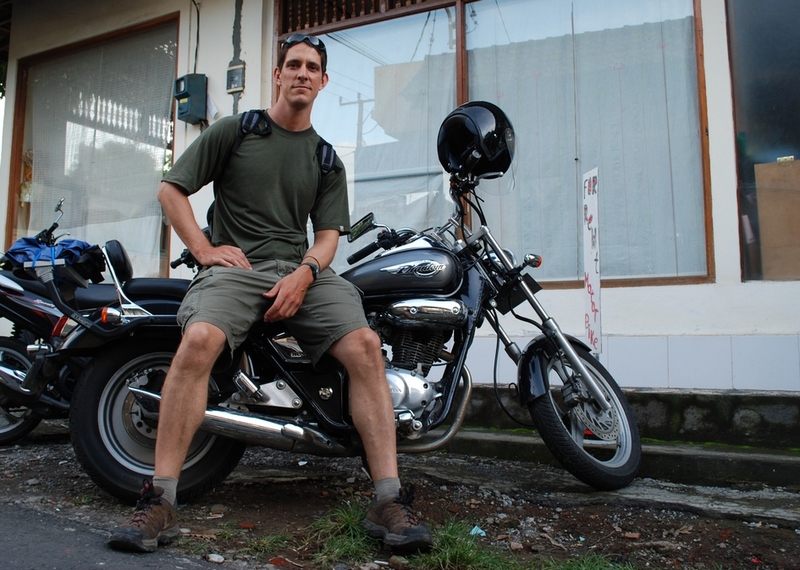 To locate a motorcycle suitable for long distance travel in good working order. Mission accomplished. I am the proud owner of a 2005 Honda Phantom. It only cost a cool 22 million rupiahs. I bought it from an Indonesian woman who appears to be forthright and honest. So now that I have the bike I need to accessorize, girlfriend! I need a cover, a front wheel lock, oodles of tools, a flux capacitor (its what makes time travel possible), two phasers, booster rockets, a rear mounted machine gun, martini mixer, and an exceedingly hot female double agent in padded leather for a sidekick. This is turning into an enormous hassle and entails me driving all over trying to find these things. The bike is not that common here (made in Thailand) so it is a bit trickier to find what I am looking for even though there are Honda dealerships and parts shops everywhere. Dealerships do not sell accessories. Why would they? That would be downright stupid. So I guess it is back to Denpasar for more practice driving through an obstacle course, a course filled with Indonesians seemingly hell bent on testing my riding prowess. 1) Drive 200 meters to orange cone. Execute left turn. Return to starting position. 2) Drive 100 meters while negotiating orange cones and maintaining balance. Upon return execute quick stop using appropriate braking method. 3) Drive 45 kilometers with entire family (minimum one additional adult and two small children) on motorcycle. Do this without use of signal light or any basic common sense. 4) Drive 5 kilometers the wrong way down a one way street with four rolled mattresses strapped to back while maintaining a constant unsafe speed. Helmets prohibited. 5) Drive as close to fellow motorcyclist as possible without making contact and, more importantly, as surreptitiously as possible. Be a ninja. 6) Make numerous turns into oncoming traffic blindfolded without reducing speed. 7) Drive along side passing motorcycle-mounted tourist while maintaining a minimum speed of 35 mph and ask said tourist if he or she: a) needs a hotel room; b) needs to rent a car or motorbike; and c) would like to purchase a woodcarving.